Method: Sight fishing with a 12ft 5x leader. Set Up: 8'0" Medium Action Cane 8ft 4wt rod made my me. Flies: Caddis Cripple, BH GRHE Soft Hackle, Black Ant, Stillwater Nymph. This might be a really stupid thing to do I thought. Six months earlier my orthopedic surgeon told me that I would never backpack or run again. Here I was planning to do just that. 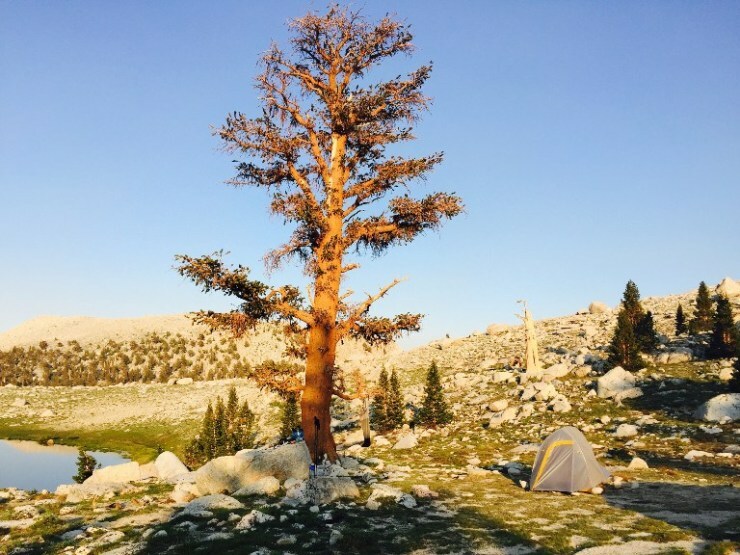 To the outside world I down played my plans, I made it seems like backpacking in to the Cottonwood Lakes basin was just a pipe dream; not something that I was actually contemplating. I told my wife, mother and anyone else that had an inkling that I was contemplating something more, that I would assess things at the trailhead and only travel as far as I felt comfortable. The 7 or 8 hour drive itself had the potential to take a lot out of me. I told them I'd assess things in the morning. If I felt comfortable hiking, I would and I'd only hike as far as I stayed comfortable. Any sign of trouble I would stop and make camp- day hiking to the lakes; or, I would return to the car, also making day hiking excursions to the lakes. That was my external face. Internally I had every intent of hiking and camping at my favorite lake. In November of last year I was diagnosed with a bulging disc in my lower back. That didn't explain the debilitating pain I was in so I looked further- eventually being diagnosed with Lyme disease. And then on closer inspection, more correctly, a Lyme "co-infection". In short, I have an evil bug inside me that is conspiring with a bulging disk to make it difficult for me to me. I'm on a slow road to recover. I made a quick day trip to butterball creek on opening day to test my hiking legs and to see if I could carry a small load. I made another trip while in Mammoth Lakes to Sherwin Lakes to do the same. 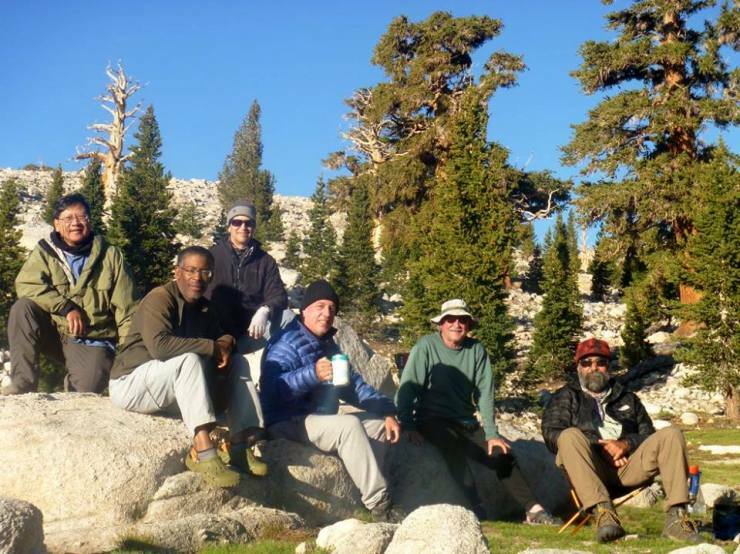 The hike to Sherwin Lakes is one of the easiest in the Sierra. I was completely gassed but also encouraged. Months of bed rest and hobbling around with a cane had left me week and out of shape but my back held up with the load. I carried a small pack all day without issues and it seemed that my secret plan was slowly taking shape. Months prior I has scoured the internet looking for a way to off-load my backpacking load from my back and onto my hips. Yes, a properly fitted backpack should "carry" on the hips but it still places a lot of stress on the core and muscles of the back. Muscles that had atrophied. I decided on a pair of tactical leg or thigh pouches and purchased two rather cheaply on ebay. Replacing my old REI Chrysalis with a Big Anges Fly Creek HV UL 1. Not carrying my extra cloths, typically, long johns, a heavy weight wool shirt and heavy weight socks. Simply not carrying anything that I haven't used during my past two backpacking trips. The parking lot at the trailhead was surprisingly empty. A dichotomy of sorts as I probably encountered more people on this trip to the lakes than I can recall on past trips. The first few miles on the trail where a bit rougher than I anticipated. 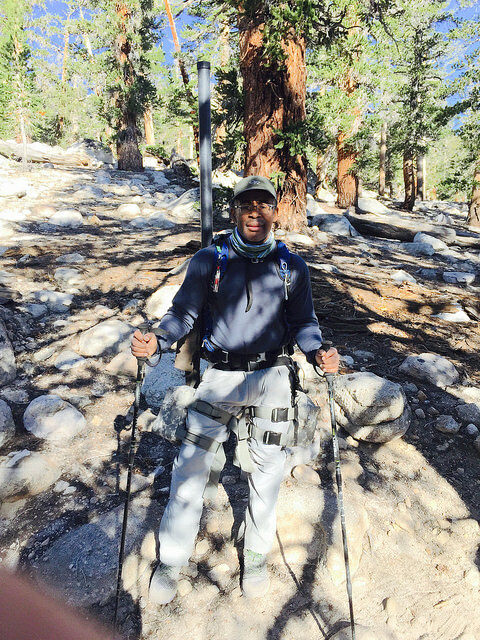 I'd made sure to balance the load between both pouches and make plenty of trial hikes at home but add on the 15 lbs pack weight and 10,000 feet elevation and I was struggling and concerned very early on. Maybe I had bitten off a bit more than I could chew. Maybe, I was slowly doing more damage to myself with each step. I stopped to reassess things and looking around, I realized I was finally back. I was in my element. I put all negative thoughts out of my head and pushed on. Mentally, I decide to break the trail up into 3 sections- the section from the trailhead to South Fork Creek, which I can usually do with ease. The section from South Fork Creek to the bottom of the last climb to the lake- which also isn't terribly difficult and the last climb itself. The most difficult part of the trip but once over, I would have arrived. The lake was a welcome sight. I made my camp at my favorite site below the "suicide tree". My name for it because it is slightly outside of the small grove of trees on the lake and closest to the water- a prime lightning conductor. There was another tent camped fairly close. I knew it was likely that a bunch of the SoCal guys from the old Fly Fisherman Southwest Board were on the lake and hoped it was one of their tents. It was mid morning and fish where rising. The shoreline brush was more overgrown than I'd remembered. I went down to my "lunch rock", a large rock on the bank just below the "suicide" tree and ate lunch. As I did, I tried to decipher the pattern of cruising fish. SoCal Bob called it out that night at dinner. Schools of 3 or 4 fish seem to have definite territories, with perhaps a little overlap but once you caught or hooked the fish in the immediate area you had to move. That was really the key initially at the lake. I fished the usual suspects- a beadhead Hare's Ear, Stillwater Nymph, Hare's Ear and Black Ant. The Hare's Ear is usually my best fly this time of year and as expected it caught the most fish. I'd worked through most of the schools on the south and east banks and the fish on the western bank were taking something smaller than I could effectively imitate despite throwing all sorts of midge patterns at them both wet and dry. (Note to future self- try a thread midge next time.....) So I decided to try my luck in the creek. The inlet creek carves a canal through matted reeds 12 to 20 inches deep. Just above the lake I drifted nymphs into several larger sweeping bends and landing a few 12 inches fish. I'd been telling myself that I needed to do more creek fishing this year so I decided to take this opportunity to do just that. There's a secondary lake above this one that I don't fish often. Between the two the stream flattens out, splits and comes back together. I fished the right side up and the left side back. The right side follows the main stem of the creek, the left the flatter areas. I fished clockwise around the lake from the bottom. I've never caught anything here and until today had never actually seen anything fish here. Most of the water, with the exception of the north eastern bank is pretty uninspiring (at least in terms of how I like to fish). The left portion or southern bank as I was making my way downstream is beautiful. Lots of rocky channels with flowing deep weeds and a low horizon which reveals the main lake below and peaks just past. 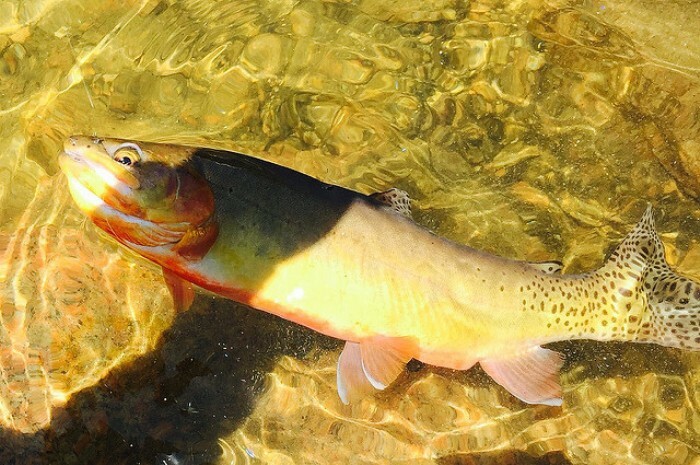 I fished dry flies up and down the creek and was successful its entire length. The portion of the creek lends itself to easy access a small pond just above the main lake. I reached the pond around 4:30 and was having fun sight fishing when as if on cue, every fish in the lake started hitting the surface all at the same time. Whatever was hatching was too small for me to see but for 10 minutes I caught fish on every cast. Not huge fish but fun, none the less. That evening at my camp I hear "Is that Jim?!?". SoCal Bob had seen the BDTS (Black Diamond Trout Society) emblem on my jacket. From the Southwest Board, Bob, Mark (who's SWB name I can't recall) and Papa Sequoia were in attendance and joined by their friends John. I hadn't seen them since my 2010 backpacking trip to this lake. It was great to catch up with them. Bob is the owner of the last cane rod I ever made. By all accounts, it's still serving him well when called upon. The next morning the SoCal crew left for parts unknown. I would catch up with some of them around lake 3 but before then I would fish lakes 1 & 2. There are two lakes in the area of eleven lakes in area that I've not fished and Lake 2 is one of them. No reason really. It's simply not on the trails that I tend to travel. Not far from Lake 1 and joined to it via a pleasant stream, I've simply not made it a point to fish it. It's quite a stunning lake. Where Lake 1 is characterized by tall weeds and grass, Lake 2 is more of an a typical high sierra lake- a bit of a tarn with a rocky shoreline and near shore boulders. I fished around the lake before heading up the inlet stream toward Lake 3. Fishing in the stream was more consistent, as you'd expect it to be so early in the season with so many fish preparing to spawn. The spawn wasn't on yet and sight fishing was consistent with both wet and dry flies. The inlet stream was crowded so upon reaching Lake 3 I turned around and headed down the trail to Lake 1. I tend to avoid Lake 3 like the plague, again, not an inspiring place for me. Lake 1 with it's high grass and abundant insect life is one of the more inspiring fly fishing lakes, both in terms of beauty and fishing potential. The fishing is never too easy on Lake 1 and always rewarding. The water was high along the bank and cold. Initially I waded along the high grass as I normally do but the cold water and uneven bank made it difficult. So I opted to fish the shore from the drier areas of the bank. These also tend to be the long shallow flats. I found better fishing in the inlet stream. Nice sized fish had moved into the stream and sight fishing was the key to approaching these fish without spooking them. There are many forks of Cottonwood Creek in this area starting with High Lake in the South and Cottonwood 6 in the north. Streams fill lakes before becoming streams and filling the next lake and this pattern continues until the streams hit the valley- all hold fish. 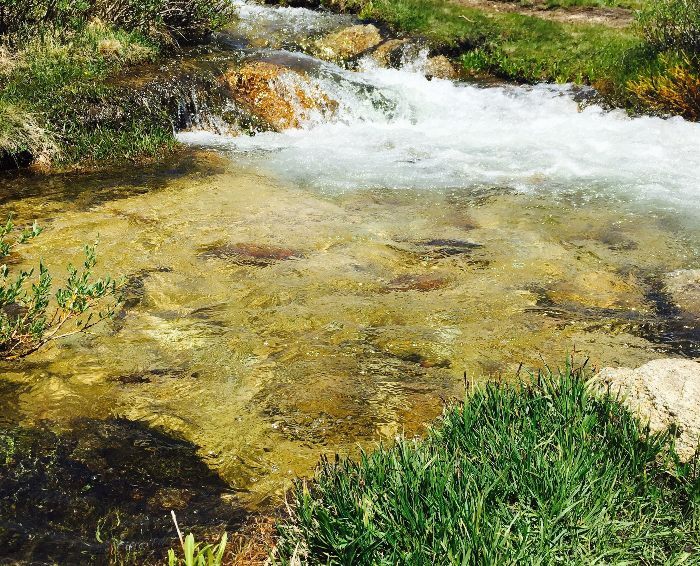 10 Lakes flow directly into the Cottonwood Creek watershed. (Another two exist outside the chain for a total of 12.) 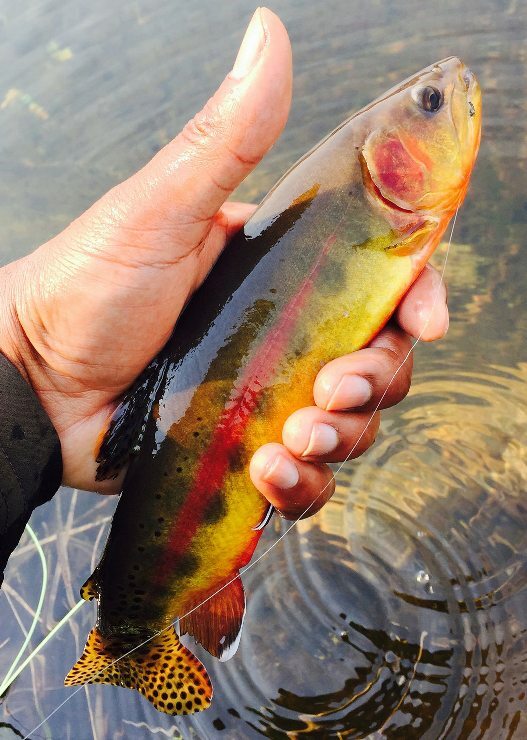 On my last day I stuck to the pattern of fishing the streams. I packed up camp, stashed my gear off the trail and hit the water. To the uninformed eye the shadows in the water might seem like rocks or fallen timber. That is of course until you notice that they are sometimes red and they move. Searching out the largest of these shadows and casting to them paid dividends. It was one of those days that makes you a better fisherman. The fish were readily taking flies as long as they didn't see you. Stand or kneel out in the open and your success rate dropped from one fish every one or two casts to perhaps one in every 15 casts. Consistency came with simply staying out of sight.